We're holding two early December trainings on invasive polyphagous and Kuroshio shot hole borer biology, identification, surveillance, and management of infested trees and downed wood. We'll cover these topics in the classroom, then head outside to see infested trees and learn how to identify signs of shot hole borer damage, set up a monitoring program, and sample trees. Continuing Education Units from DPR have been requested, check back for updates. Speakers include Sabrina Drill, UCCE Natural Resources Advisor; Bea Nobua-Behrmann, UCCE Research Scientist; Kim Corella, Forest Pest Specialist, CalFire; and Paul Rugman-Jones, Research Entomologist, UC Riverside. The New Borers and the Lack of Public Interest? Without a doubt the borers, PSHB and KSHB are going to hurt avocado production, but there are some California native and landscape trees that are also going to get hammered, like unto death. Much has been written about the borers in the press, from ag journals to environmental newsletters to newspapers, such as the New York Times, Los Angeles Times and more local papers like the Ventura Star and Riverside Press-Enterprise. Recent trap findings of PSHB in Ventura county brought a local gathering of community groups to discuss the situation and the need to get more information out to local residents of the major environmental disaster at our doorstep, It seems most homeowners are not aware of the problem or if so marginally so. Is it because it's viewed as just an avocado growers' problem? The CA Avocado Commission has lead in research and spending on this problem that will affect all citizens, not just growers and consumers of the fruit. Are we all just overwhelmed by the disasters that are occurring around us here and world-wide? I'm not sure why the lack of general interest in this issue, but the only way to get control of these pests is to stop their movement, which is largely through humans moving contaminated wood. Slowing the spread will give time to develop control methods and measures that will allow our native woodlands to cope with this infestation. There are currently people looking for pathogens and parasites in the native range of these pests, in order to determine if those native control measure would fit into a California system. But this is going to take time and in the meantime the spread needs to be slowed. Talk to your neighbors, co-workers and friends. And have them talk to their neighbors, co-workers and friends. Get the word out about what we can all do to slow the spread. Listed below are some of the common plants in which the borer can reproduce and spread its fungi that kill the tree. Many more trees have been identified to which the borer goes, but as yet it's not known whether the fungi spread in those trees. Oak woodlands are the most biologically diverse habitat in the state of California. The foremost oak researchers in California and the Pacific Northwest, plus researchers from Spain and South Korea, converge in Visalia for the 7th California Oak Symposium Nov. 3-6. This is the symposium's first appearance in the San Joaquin Valley since its inception 35 years ago. "The drought will be a major focus of the symposium," said Rick Standiford, UC Cooperative Extension forest management specialist based at UC Berkeley, and symposium coordinator. "We will also have cutting edge research and policy presentations on sudden oak death, gold-spotted oak borer and conifer encroachment in black and Garry oak woodlands, among much more." California's oak woodlands cover 10 percent of the state, and oaks are a key ecological component of conifer forests. 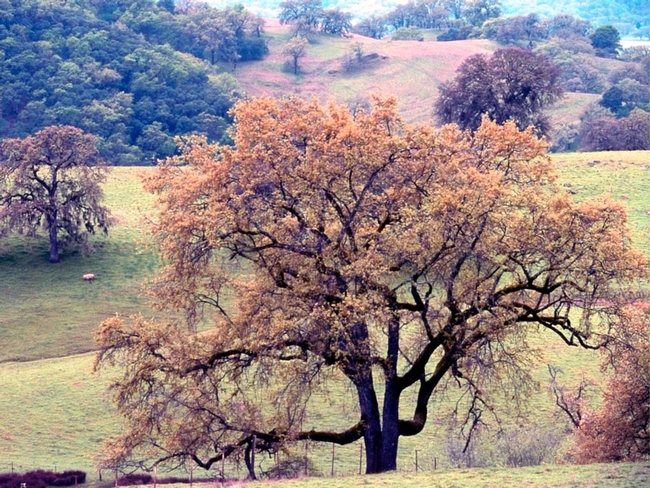 There are more than 20 species of native California oaks; several are found nowhere except within the state's borders and some others range only as far as Canada and Mexico. Oak woodlands are the most biologically diverse habitat in the state, making conservation a policy and management priority. 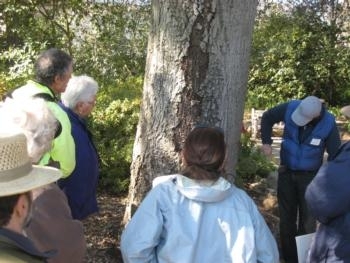 The symposium begins with tours of regional oaks on Nov. 3. One group will tour the Visalia urban oak forest; a second group visits the Kaweah Oaks Preserve and Dry Creek Preserve. Over three days, scientists will present 58 research papers on oak management, wildlife, ecosystem services, ranching and utilization, gold-spotted oak borer, oak restoration, and sudden oak death. Ten of the projects focus on oak conservation, touching on such topics as economic incentives for oak conservation, the oak conservation program at Tejon Ranch, and establishment of Oregon white oak and California black oak in northwestern California. The wildlife series of presentations provides new information about native and introduced species that make their homes among the oaks, including European starlings, Pacific fishers, bats and wild pigs. Some of the ranching topics to be discussed include the public and private incomes from forests in Andalusia, Spain, economic incentives related to recreational use of private oak woodland, and acorn production and utilization in South Korea. Since 1979, the California Oak Symposium has been held every 5 to 7 years; the last one was in Rohnert Park in 2006. Visalia was selected for the symposium because of its geographic convenience for both northern and southern California oak scientists, and the city's commitment to the preservation and protection of native oak trees. A coast live oak tree attacked by western oak bark beetle. “We have found declining coast live oak trees throughout urban landscapes in Los Angeles, Orange, Riverside, Santa Barbara, Ventura and Monterey counties,” said Akif Eskalen, UC Cooperative Extension specialist in the Department of Plant Pathology and Microbiology at the University of California, Riverside. Eskalen recovered the fungal species, Geosmithia pallida, from tissues of infected coast live oak trees and performed pathogenicity tests on it in his laboratory at UC Riverside. The tests showed that the fungus is pathogenic to coast live oak seedlings and produces symptoms of foamy canker. The western oak bark beetle, which spreads the fungus, is a small beetle — about 2 millimeters long — that burrows through the bark of the coast live oak tree, excavating shallow tunnels under the bark across the grain of wood. Brown in color, this beetle is native to California. Female beetles lay their eggs in the tunnels. It is not known at this time if the beetle infects trees other than coast live oak trees. 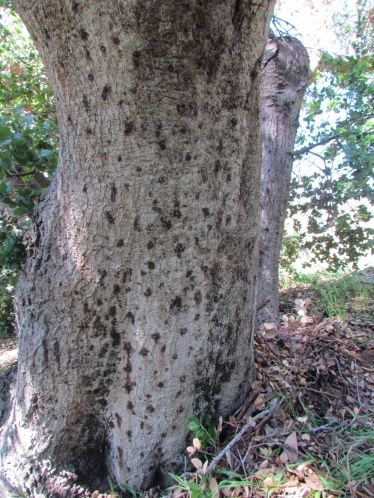 Symptoms of foamy bark canker disease include wet discoloration on the trunk and main branches of the infected coast live oak tree. This discoloration surrounds the entry holes that the western oak bark beetle makes to burrow into the tree. 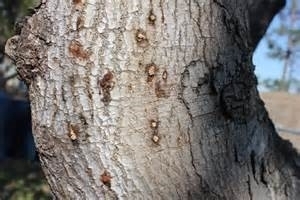 Multiple holes can often be seen on an infected tree. Eskalen explained that when the infection is at an advanced stage, the coast live oak tree dies. Currently, no control methods are in place to control the fungus or the beetle. If you suspect your coast live oak tree has the symptoms described above, please contact your local UC Cooperative Extension advisor, pest control adviser, county agricultural commissioner's office or Eskalen at akif.eskalen@ucr.edu. To see more photos, visit http://ucrtoday.ucr.edu/22096. A 12-year study published in the July-September 2012 issue of the University of California’s California Agriculture journal demonstrates that cotton grown in rotation with tomatoes — using lower-impact conservation tillage — can achieve yields similar to standard cultivation methods and at lower cost. Conservation tillage seeks to reduce the number of times that tractors cross the field, in order to protect the soil from erosion and compaction, and save time, fuel and labor costs. Cotton crops are planted directly into stubble from the previous crop in the rotation. In the study, conducted from 2000 to 2011 at the UC West Side Research and Extension Center in Five Points (southwest of Fresno), the number of tractor passes for a cotton-tomato rotation grown with a cover crop was reduced from 20 in the standard treatment to 13 with conservation tillage. By the final years of the in the San Joaquin Valley study, cotton lint yields were statistically equivalent and even higher (in 2011) than with standard cultivation methods. “The UC studies have consistently shown that conservation tillage can yield as well as standard tillage in a cotton-tomato rotation,” lead author Jeffrey P. Mitchell, UC Cooperative Extension specialist in the Department of Plant Sciences at UC Davis, and co-authors wrote in California Agriculture journal. 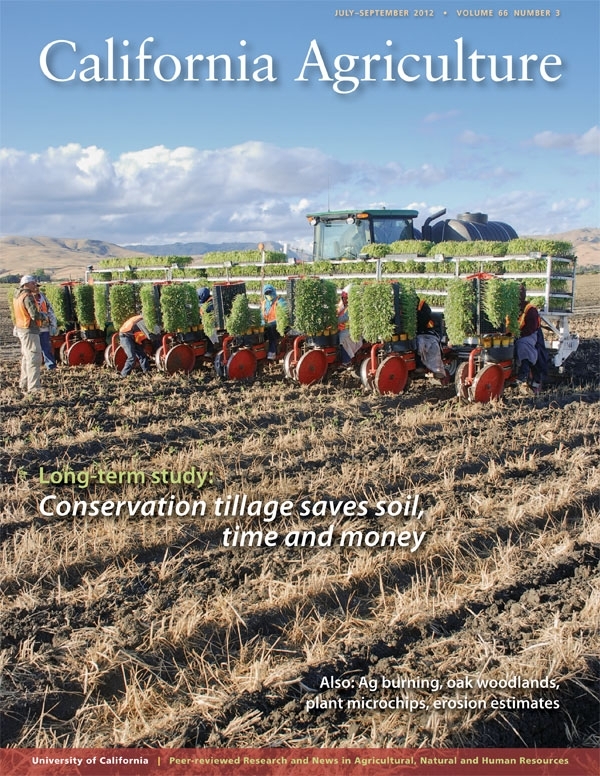 Their study, “Conservation tillage systems for cotton advance in the San Joaquin Valley,” as well as the entire July-September 2012 issue of California Agriculture journal, can be viewed and downloaded online at: http://californiaagriculture.ucanr.edu. Mitchell is a founder of Conservation Agriculture Systems Innovation (CASI), a diverse group of more than 1,800 farmers, industry representatives, UC and other university faculty, and members of the Natural Resources Conservation Service and other public agencies (http://ucanr.edu/CASI). CASI defines conservation tillage as a suite of cultivation practices — including no-tillage, minimum tillage, ridge tillage and strip tillage — that reduce the volume of soil disturbed and preserve crop residues in the field. Conservation tillage is common in other regions of the United States and parts of the world and is beginning to gain acceptance in California agriculture. Technological upgrades to tillage implements have been critical to the advancement of conservation tillage systems. These include equipment that can target operations to just the plant row rather than the whole field as well as accomplish several operations at the same time. Fuel use was reduced by 12 gallons and labor by 2 hours per acre in the conservation tillage plots. This amounted to savings of about $70 per acre in 2011 dollars. Agricultural burning and air quality: Southern California farmers in Imperial County regularly burn crop residues of bermudagrass in the winter and wheat stubble in the summer. A study of ambient air quality adjacent to and downwind of agricultural burning sites in the desert county found that particulate matter levels (PM2.5) were 23% higher on burn days than on no-burn days at four locations. Researchers from the California Department of Public Health also assessed community educational needs regarding agricultural burning and developed fact sheets in English and Spanish targeting the general public, schools and farmers. The value of privately owned oak woodlands: More than 80 percent of California’s 5 million oak woodland acres are privately owned. In a survey, researchers from Spain and UC Berkeley asked private owners of California oak woodlands to place a monetary value on amenities from their land such as recreation, scenic beauty or a rural lifestyle. The technique, called “contingent valuation,” found that landowners would be willing to pay $54 per acre annually for private amenities from their land and that their willingness to pay per acre decreased as their property size increased. Microchips for woody plants: Radio-frequency identification (RFID) tags are widely used to track books in libraries, products during manufacturing, cattle from rangeland to the slaughterhouse, inventory in retail, runners in road races and much more. These tiny microchips (often the size of a grain of rice) are now being placed in woody plants such as grapevines and orchards to monitor crop diseases, track irrigation and pesticide applications, and help prevent the theft of valuable plants. In this review, Italian researchers discuss the emerging uses of RFID technology in agriculture. Rainfall simulators to measure erosion: In their efforts to keep Lake Tahoe clear, researchers have been studying the movement of sediments into the lake using rainfall simulators. These fairly simple machines are placed on a slope; “rain” is created over a small frame, which allows sediment in the runoff to be collected and measured. However, the lack of standardization in erosion studies using rainfall simulators may be hampering progress. Mark Grismer, professor in the Department of Land, Air and Water Resources at UC Davis, makes the case for standardized field methodologies and data analysis. California Agriculture is the University of California’s peer-reviewed journal of research in agricultural, natural and human resources. For a free subscription, go to: http://californiaagriculture.ucanr.edu, or write to calag@ucanr.edu. WRITERS/EDITORS: To request a hard copy of the journal, e-mail jlbyron@ucanr.edu. Monday- Thursday: 8 a.m. to 5 p.m.